Melissa* was at wit’s end. Her daughter Olivia’s school district did not agree that special accommodations were necessary for the little girl, who has a feeding disorder and needs reminders and encouragement to help her with eating and using the bathroom. The stress of the medical condition was intense for Melissa and her husband, and the potential for legal action against the school district created even greater turmoil. They knew they might need an attorney, but they simply couldn’t afford one. That’s when Melissa’s “cavalry,” as she calls them, entered the picture — some wearing white coats and others carrying legal reference books. First, Amy Drayton, Ph.D., assistant professor of pediatrics and communicable diseases and director of the Feeding Disorders Program at C.S. Mott Children’s Hospital, referred the family to the Pediatric Advocacy Clinic at the U-M Law School. The clinic is a medical-legal partnership, part of a growing national network that addresses the social conditions affecting people’s health and well-being. Meeting with Law School faculty and students, Melissa showed them photos of Olivia and told them about her struggles. The legal team, including clinical teaching fellow L. Kate Mitchell, took it from there. They obtained statements from Olivia’s doctors and researched the legal information needed to create a 504 plan under a federal civil rights law that guarantees people with disabilities equal access to an education. Law students and their faculty supervisors have been engaged in similar activities and have partnered with U-M medical providers since the clinic started in 2004. Beginning in October 2016, pediatric residents from Michigan Medicine have joined as well; several of them have done month-long rotations at the clinic and worked with the legal team on cases involving special education, Medicaid coverage for devices such as continuous glucose monitors and more. The partnership, and the clinic itself, address the fact that about one in six people needs legal care to be healthy, according to the National Center for Medical-Legal Partnership. 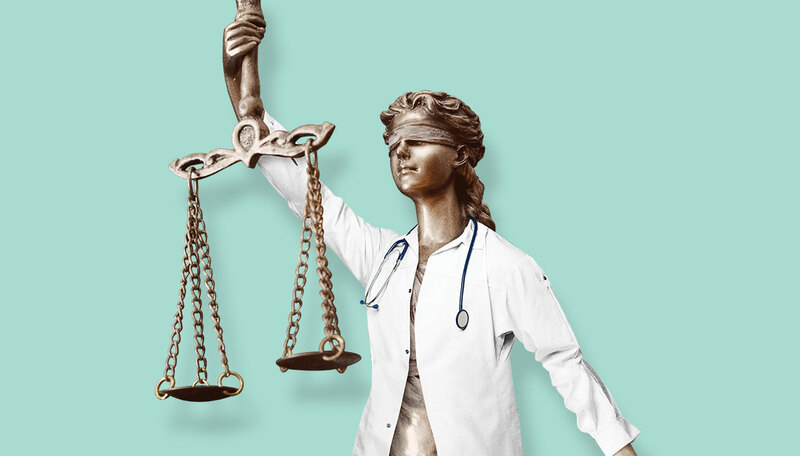 Having medical and legal experts working together also allows students and faculty members to focus on their areas of expertise. “It gives us perspective for the legal arguments we are making, and it allows us to use our time more efficiently,” says Hanna Ali, a first-year law student. The team came together for a meeting Melissa had with representatives from her daughter’s school district. She couldn’t sleep the night before, worried about talking during the meeting. But the law students and their supervisors, a pediatric resident and Drayton all spoke about Olivia’s condition, her needs and what should be included in her 504 plan. Melissa barely spoke and was happy to let her team advocate on Olivia’s behalf. Still, the school district representatives said that Olivia was doing well at school without the accommodations. “It’s a poorly understood diagnosis, and Dr. Barbara Felt [director of developmental behavioral pediatrics] and I tried to explain to the school district the consequences of (Olivia) not having accommodations for regular bathroom use, which in severe untreated cases could even include hospitalization,” says second-year pediatric resident Christine Wang, M.D. She also pointed out that the collaboration between Michigan Medicine and the Law School can lead to improved health outcomes for children. A second meeting about the 504 plan followed, at which the school district said it would make several of the accommodations for Olivia that her mother had requested. It’s not everything she wanted, but it’s a start, she says. *Names of the patient and her mother have been changed to protect their privacy.